For The Cake: Adjust oven rack jto middle position and heat oven to 350 degrees. Grease three 8 inch round cake pans, line with parchment paper, grease parchment, and flour pans. Pulse ½ cup sprinkles in food processor until coarsely ground, 8 to 10 pulses; set aside. Whisk together egg whites, milk, and vanilla in bowl. Using stand mixer filted with paddle mix flour, sugar, baking powder, and salt on low speed, about 30 seconds. With mixer running add butter, 1 piece at a time. Until incorporated and mixture resembles moist crumbs. Add all but ½ cup egg mixture and mix until just combined. Increase speed to medium high and beat until light and fluffy, about 1 minutes. Add remaining ½ cup egg mixture in slow stream. Scrape down bowl and beat on medium high speed until well combined, about 15 seconds. Stir in ground sprinkles. Divide batter evenly among prepared pans and smooth tops with rubber spatula. Bake until toothpick inserted in center comes out clean 21 to 25 minutes. Rotating pans halfway through baking. Let cakes cool in pans on wire rack for 10 minutes. Remove cakes from pans, discarding parchment, and let cool completely on rack, about 2 hours. To Assemble: mix food coloring into frosting. Place 1 cake layer on plate or pedestal. Spread ¾ cup frosting evenly over top. Top with second cake layer, then spread ¾ cup frosting evenly over top. Top with third cake layer, then spread remaining frosting evenly over top and sides. 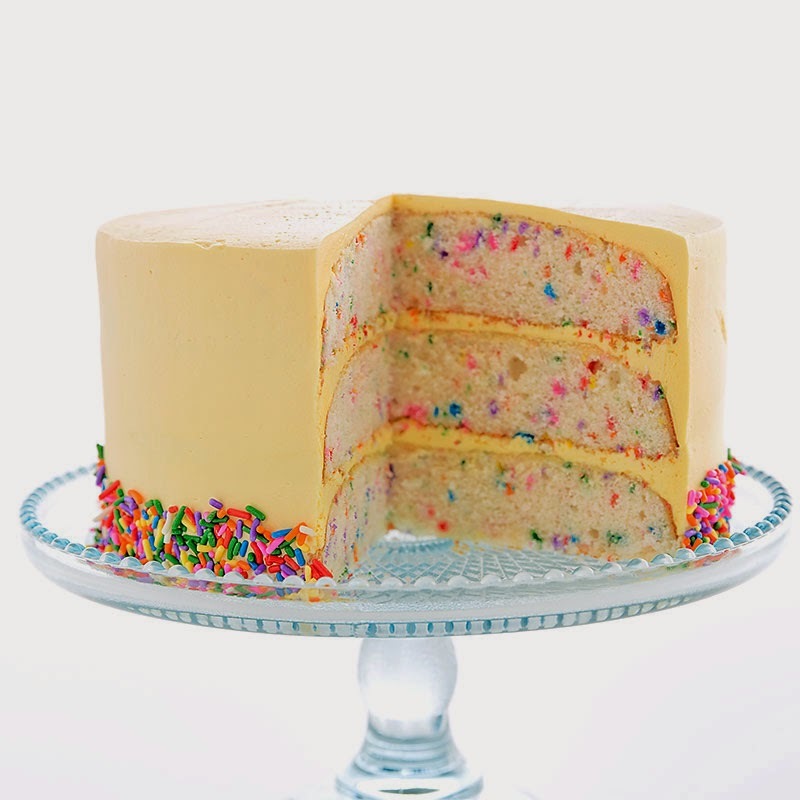 Press remaining ¼ cup sprinkles around bottom edge of cake. Serve.